New membership form for 18-19! View the Membership Frequently Asked Questions here (updated for 2018-2019). Dues is $106.70 a month, or $53.35 per paycheck, pre tax. This is deducted automatically, before taxes. Your dues goes to your membership of NEA, CTA, as well as your local, CVEU. Come to our Member Meetings the Last Tuesday of every month! 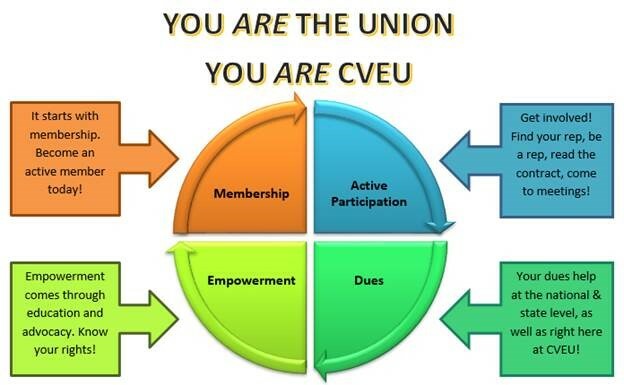 CVEU Membership = Security, Strength and Solidarity. Security By becoming a CVEU member you will have the backing of all your CVEU peers to support you in navigating this first contract. We will now have job security,which means that teachers can no longer be laid off without cause, and if cause is determined you now have CVEU to help support you through the grievance procedure to determine if the cause was valid. CVEU members also now have the security in knowing that their voice will be heard. By becoming a member you will have a say in future contract negations and help guide the goals of the union. Strength As we have all seen with the changes that were made after the collective voice letter, caseload petition and the strike vote, when we come together we can make real changes for the betterment of our teachers and our students. CAVA will know how many members are a part of CVEU and with low enrollment in our union it will be much harder for CVEU to make any lasting change in the future. We are only strong when we come together. Solidarity CVEU members are here to support each other through Facebook groups, phone calls and more. Most importantly we are here to help each other out. By becoming a member you are becoming a part of a groundbreaking movement that includes teachers outside of CAVA that are united in providing the best work environment for teacher and the best possible success for our students. Many of our fellow teachers outside of CAVA have supported us through these last four years of struggling to become a union and develop a fair contract. We now have the chance to support other schools as they go through the same process as us by becoming a full member of CVEU. There are many other benefits that come with being a member of CVEU and CTA such as discounts, trainings, and access to a lawyer, but for many of us nothing is more important than the Security, Strength and Solidarity of being a CVEU member. Please take a moment today if you have not already and complete your membership form that is attached and email it to cveu.membership@gmail.com.